For many drivers in Phoenix, auto repair can be a great source of frustration. The fact that you can never pinpoint when something in your vehicle is going to fail can cause some discomfort. Generally the vast majority of drivers are content to wait it out and deal with the problem when it surfaces; here at Tucker Tire and Auto, we want to help you get a handle on car repairs before they cause serious damage. The fact is, the only way to achieve this is through regular inspections and preventive car maintenance procedures conducted by a professional. With this tactic, you may find yourself needing very few car repairs. Another benefit is the ability to schedule a repair when it is convenient for you. Especially with major auto repair, the cost can take many people by surprise and be a great source of frustration when the bill exceeds expectations. It is for this reason that we recommend regular vehicle inspections, and scheduled maintenance procedures at prescribed mileage. The ability to prepare for these costs will save you the sudden shocks to your finances, and your vehicle will retain the highest performance level possible. Even after several years your vehicle will retain the highest resale value possible, and keep you driving in confidence. At Tucker Tire and Auto, we consider maintenance to be an extension of the investment that your vehicle represents. By making sure that your vehicle receives the attention it needs, you have a much better chance of preserving the value of your vehicle. For us, it is extremely important that our customers receive the greatest benefit from the services we provide. Because we are a NAPA AutoCare Center, our customers are covered by the NAPA Peace of Mind Warranty. This means that when you use NAPA parts, your repairs are covered for 2 years or 24 thousand miles for both parts and labor. Providing this to our customers is important because it solidifies your ability to drive with confidence. At the bottom line of automotive repair, it is extremely important that the technicians who conduct the repair are well qualified and highly skilled. Because we hire ASE Certified technicians, we are able to ensure that your vehicle will be repaired to factory specifications or better. This means that you will never have to worry about our technicians cutting corners, or using substandard parts or equipment. At Tucker Tire and Auto, we take great pride in the fact that we have been taking care of our customers since 1954. Our business practices have changed little over the years, and we still place our customers needs at the foremost of our consideration. 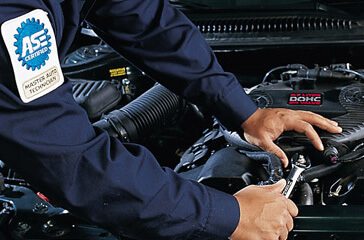 We invite you to contact us if you have any questions or concerns about the health of your vehicle. Our staff is here to make sure that you receive the help that you require.